1936 Talbot Lago T150C Cabriolet marked a moment where design wasn’t just a focus on aesthetics, but aerodynamic performance. These new European automobiles were not only visually stunning, they sped through the air like feathers amongst bricks. 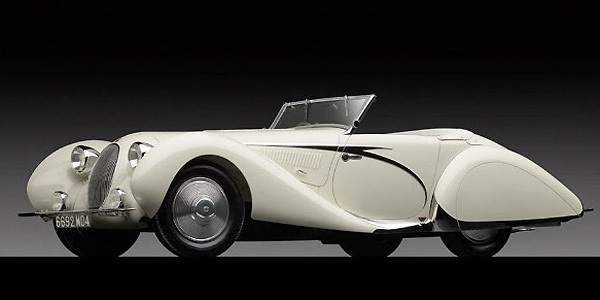 The 1936 Talbot Lago T150C Cabriolet looked frighteningly fast. Body designed by Italian-born Giuseppe Figoni and produced by business partner Ovidio Falaschi. Powered by an inline-6 engine that produced about 140 horsepower, a competitive number back in the mid-1930s. It topped out at 115 mph on straightaways, and its aerodynamic appeal gave it an edge while accelerating out of turns. By the turn of the decade, Figoni had begun to earn commissions for racing cars, and these unlikely orders began to shift the coachbuilder’s image and reputation in a more sporting direction. Alfa Romeo, Lancia, Bugatti, and other sporting marques began to appear more prominently in his shop. These years also saw the birth of Figoni’s aeronautically inspired designs. The coachbuilder’s shop was located near an airfield, and he was a daily witness to aerodynamic efficiency. The curved shapes of the aircraft were to become a major inspiration in Figoni’s creations.